The Boston Women’s Film Festival (Sept. 27-30 at the Museum of Fine Arts, Coolidge Corner, and the Brattle) makes a timely return after a hiatus of 15 years. It includes several documentaries that show how social oppression and personal hardship can be transformed into female empowerment through political, artistic, and athletic endeavors. Kim Chambers, subject of Kate Webber’s “Kim Swims” (screens Sept. 28 at 1:30 p.m. at the MFA followed by a Q & A with the director) excels at the latter. After suffering a gruesome injury which almost resulted in her leg being amputated and then enduring two years of painful physical therapy, Chambers tried swimming as a form of rehab and realized this was her medium. The New Zealand native developed into a world-class long-distance open-water swimmer who, among other feats, swam the 21-mile-wide North Channel between Scotland and Ireland despite multiple jellyfish stings and hypothermia. That almost killed her, but Chambers is one tough Kiwi. 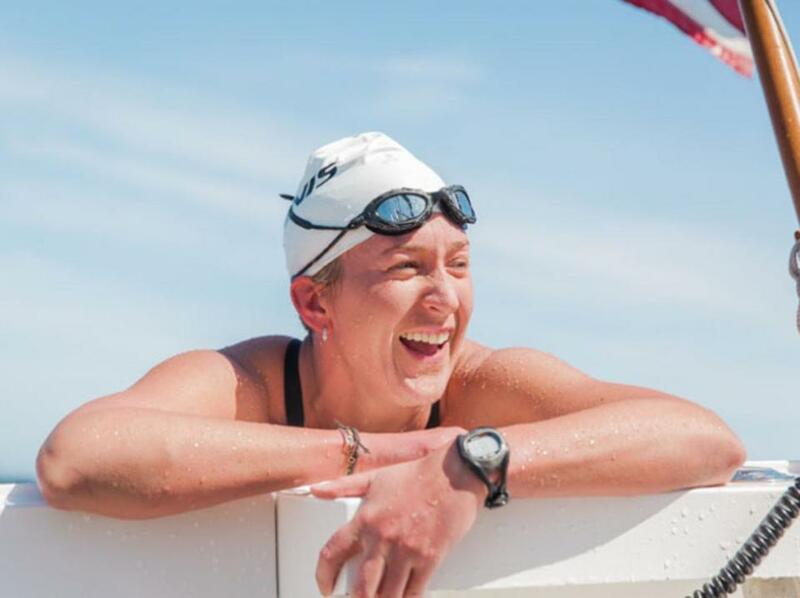 Her new project is to be the first woman to swim across the 30 miles of freezing, shark-infested waters from the Farallon Islands to the Golden Gate Bridge. Webber’s film records her intense training and her grueling, but gleeful attempt. Why does she do it? In part to prove that women can compete in a male-dominated sport. But mostly she is driven by her love of a literally oceanic experience and a need to push her body to its limits. Narcissister, the director and subject of “Narcissister Organ Player ” (screens Sept. 28 at 8:30 p.m. at the MFA followed by a live performance by artist Lani Asuncion) never discloses her name or shows her face in public. She wears a mask, often a blank one, like that in Georges Franju’s “Eyes Without a Face”, and if she removes that mask there is another behind that and another on the back of her head as well. But that is the least of her transformations. She wears costumes in which legs become arms, bottoms become tops, fronts become backs. In an appearance on “America’s Got Talent,” her two minutes of prime time quickly changed the panel’s skepticism to astonishment and delight. Many of her performances include ingenious puppetry and oversize, anatomically correct set designs, and often she wears nothing except the mask — and a merkin. Though her work is ironic and provocative, the film is intimate and emotionally raw. Narcissister shares her personal life, her feelings of disconnection growing up as a mixed-race child, her grief at her mother’s death, her determination not to submit to traditional gender roles, and her dedication to an art that reflects her experiences with surreal and playful inventiveness. Guo Pei, the subject of Pietra Brettkelly’s “Yellow Is Forbidden” (screens Sept. 29 at 2 p.m. at the Brattle) is another artist who has made a stir in her medium. One of the few female fashion designers in China, she was raised during the brutal puritanism of Mao’s Cultural Revolution and now her creations strive for exquisite excess. They loom on towering, ornate shoes, are embossed with gold, supported with metal frames, detailed with lace, bangles and filigrees that take years to hand stitch, and can weigh a model-toppling 60 pounds. They evoke paintings by Gustav Klimt, the fashions of Versailles, and the bizarre ecclesiastical fashion show that concludes “Fellini’s Roma” (1972). Brought to world attention when Rihanna wore her enormous egg-yolk-yellow dress with its acres of train to the 2015 Met Gala , here she tries to gain entry to Paris’s exclusive Fédération Française de la Couture while preparing for an ambitious show. The latter, inspired by the doomed court of Marie Antoinette, celebrates wealth and excess almost to the point of vulgarity, but still shimmers with an otherworldly sublimity. That’s how Carrie Goldberg describes the stalking, harassment, threats, and dissemination of outrageous, reputation-destroying lies men have unleashed online against women — often anonymously and usually with impunity. Goldberg endured this treatment from an ex-boyfriend for years without getting any help or sympathy from the authorities. She decided that if no one else is fighting it, then she must. A skilled lawyer, she has founded a New York law firm that specializes in cases like hers in which a woman is digitally brutalized. Anita Sarkeesian is numbingly familiar with this experience. After she critiqued online sexist caricatures and the players who loved them in her Web videos “Tropes vs. Women in Video Games,” she was deluged with thousands of grotesque online insults and obscene threats from faceless trolls in what has become known as the “Gamergate” controversy. Nonetheless, she perseveres with her increasingly popular podcasts and enlightens women — and men — about this dark side of the internet. Like Goldberg, Tina Reine endured the irrational revenge of an ex who started a website maligning her with vicious fabrications. Though she had an MBA, Reine found that she any random Google search rendered her unemployable in her profession and she had to work as a waitress. But she, too, fought back, and for years battled in court to have the malignant material taken down only to be told that the perpetrator’s First Amendment rights trumped her right to privacy and to maintaining her own identity. She just wants to have an ordinary life, she says, and like her counterparts in the film, achieves something extraordinary to do so.